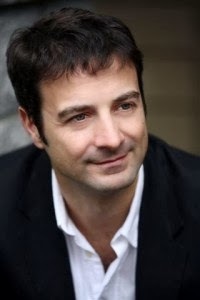 I am so excited to welcome author Daniel Kalla back to Booking Mama. I recently reviewed his latest novel RISING SUN, FALLING SHADOW, and I thought it was a terrific sequel to THE FAR SIDE OF THE SKY. Mr. Kalla wrote a guest post for my Book Club Exchange feature a little over a year ago, and now he's back with a very entertaining essay about his "fear" of book signings! I'm not shy. In fact, I kind of enjoy public speaking. Last year, I wrote a blog gushing over how much fun I have attending book clubs. I raved about the perks: the informed audience, insightful conversation and, of course, the often "bottomless" wine glass! But there are never ever bottomless wine glasses at a book signing! And that's only one tiny factor contributing to my aversion of these emotionally hazardous outings. Earlier this week, for the debut of my new novel, RISING SUN, FALLING SHADOW, I was invited to do a reading before the Probus Club in Vancouver. My first reading for this novel! I approached the event with my usual trepidation. I envisioned a cavernous auditorium with me at the front and an AV guy at the back and two bored-looked people scattered in the hundreds of empty chairs between us. As it turns out, it was a fantastic morning that I spent with two hundred interesting women, many of whom had already read the first installment of my Second World War Shanghai novel series, THE FAR SIDE OF THE SKY. Their enthusiasm and support, not to mention the terrific book sales, blew my expectations out of the water. So, you might ask, what the hell am I complaining about?! Well let me put it in context by describing a slightly less successful event. About six years ago, I was invited to a signing inside an AAFES exchange store at Ft. Lewis in Washington State to promote a new novel at the time. (For those of who you who have never seen an exchange store, imagine if someone merged a Costco, a Target and a Macy's into one entity.) The people running the store couldn't have treated me better. They aggressively promoted my appearance with enormous posters—I'm talking Saddam Hussein-sized headshots—and they put me at a table right at the front of the store with what can only be described as a mountain of my own books behind me! It was a gray rainy Saturday; absolutely perfect for foot traffic. And man, was there a lot it! The problem was that none of the visitors had come to see me. People rushed past me as though I was there to clean up a particularly unpleasant spill. A few kind souls stopped to ask me where they could find eggs, beer, camping supplies, etc. After the first hour, I had sold roughly four of the four thousand books behind me. And then, something remarkable happened. It actually got worse! Another table was set up across from me… for the Arizona Cardinal cheerleaders to sign their Christmas calendars. You can imagine that if scantily clad cheerleaders came to an army base to autograph their photos, there might be a response. “Stampede” would be a better description! The lineup extended out the door and snaked around my lonely table (with the life-sized posters of me and the insurmountable pile of my books). The only thing that saved from melting under my table was that, even at the time, I could actually see the humor in the situation. Of course, these two scenarios are, for me, the extremes of the spectrum when it comes to book readings/signings. I’ve done events with surprisingly good turnouts and others that were disappointingly unattended. I have to say that invariably the people who do show up are polite, attentive and generous. But for me, nothing can compensate for the hollow sense of personal and professional inadequacy that comes with addressing an almost empty room or bookstore. So until I write my own boy wizard, love-struck vampire or religious cryptographer/detective blockbuster that turns me into a household name, I'm going to remain leery of book readings. But please do keep inviting me to your book clubs, where the company is always guaranteed and the wine is never rationed! A huge thanks to Mr. Kalla for providing such a fun guest post! Daniel Kalla is the international bestselling author of PANDEMIC, RESISTANCE, RAGE THERAPY, BLOOD LIES, COLD PLAGUE, and OF FLESH AND BLOOD. His books have been translated into eleven languages. Two novels have been optioned for film. Kalla practices emergency medicine in Vancouver, British Columbia, where he lives with his family. 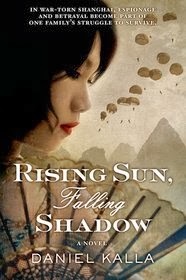 Giveaway alert: I have a copy of RISING SUN, FALLING SHADOW to share with one lucky reader. To enter, just fill out the form below before October 10th, 11:59 p.m.EST. I will randomly select and notify the winner the following day. This contest is open to those of you with U.S. and Canada addresses only. Good luck! What a great post!! OMG I can just picture those cheerleaders and the huge line. Too funny. What a fun post! It's hilarious that he was signing at the same time as the cheerleaders!